Every week for the past year or so kentuckyguard.com has published stories by Kentucky National Guard unit public affairs historian representatives, also known as UPAHRs. For those who don’t know, this is an additional duty taken on by a Soldier or Airmen with the intent of telling their unit’s story. Today’s story is different. Today the story is about a UPAHR instead of being presented by one. GLASGOW, Ky. — Sgt. Bryan Ploughe is a dynamo. If you don’t believe it, just ask anyone around him. The man never has a bad day. He’s one of those guys who has a passion for life and loves being around Soldiers and the National Guard. 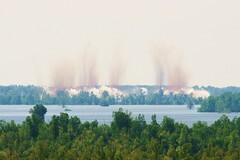 During last year’s flooding in western Kentucky he was on the road for days documenting the mission of his unit, 1st Battalion, 623rd Field Artillery, and getting photos that the mainstream media couldn’t get due to impassable roads and dangerous conditions. Click here for one of Ploughe’s stories on the 623rd’s flood mission. 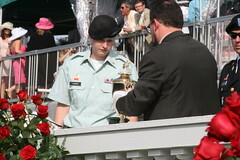 He’s also been on hand to photograph Kentucky National Guard Soldiers taking part in prestigious events like the Running of the Roses, aka, the Kentucky Derby. Ploughe’s passion sometimes gets out of hand. Whether he’s on the phone during his regular personnel services duties for the troops or as the unit’s safety NCO, you know he’s in the office. 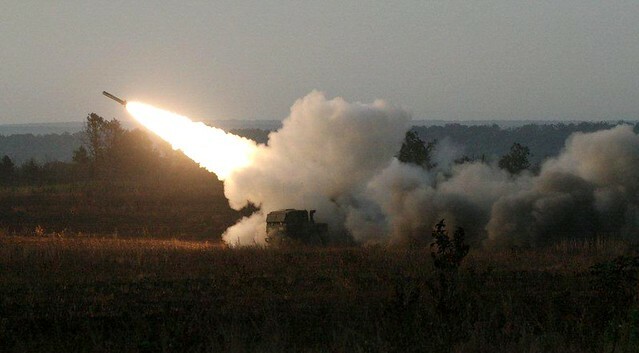 Ploughe’s most recent accomplishment being named runner up in a photo competition held by Fires Bulletin, the U.S. Army’s official artillery magazine. It’s something he’s proud of, not so much for himself as for the recognition it brings on his unit. Click here to see the January-February edition of Fires Bulletin. Ploughe pursues his responsibilities as a UPAHR with same intensity as he does everything else — as though it’s his mission in life. “I try hard to get the word out to the community what the Guard does,” he said. “It’s not just parades, not just junior guard stuff. We’re there for support during floods and tornadoes, and we have to go fight wars. A veteran of the war in Iraq, Ploughe plans to pursue military journalism as an MOS. He’s currently scheduled to attend the public affairs basic course later this year. In the words of the good sergeant, have a Ploughe day! For information on the UPAHR program contact Capt. Stephen Martin, 502-607-1798 email stephen.d.martin@us.army.mil.